We’d been meaning to eat at 60 Hope Street for a quite while and we’re not sure how we hadn’t managed to get there sooner. The occasion that finally got us there, however, was my mums 60th birthday. And on a recommendation from my brother we managed to book a table for what turned out to be a rather pleasant dining experience. We only wish we’d taken the opportunity before! On arriving we went downstairs to the Bistro/Bar area and ordered a drink, this was the only sneaky tactic I didn’t like as our table was ready and waiting when we arrived, but some restaurants do have a bad habit of getting you to order a drink before ordering wine for the table. When we were eventually seated (we played a game of musical chairs first!) the Maître d’ came over and handed out the menu’s. He then theatrically read aloud the days ‘specials’. We’re not sure if he was new and performing with much enthusiasm or is always so entertaining, but with much gusto he detailed the dishes brilliantly. It took us a while to eventually decide on what to order but I think between us we sampled quite a few of the dishes. 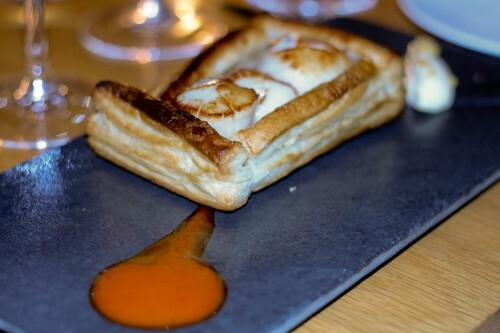 To start I ordered Scallops in pastry with red pepper & aioli and Anthony eventually decided on the Assiette of Duck. The scallops were fantastic and cooked beautifully. Personally, I didn’t think they needed the puff pastry or anchovies contained within. The scallops and aioli would have been good on their own. 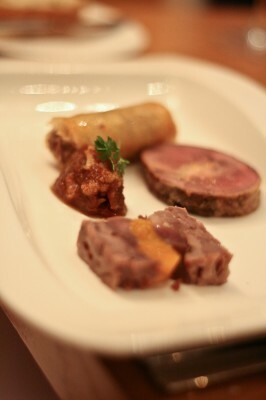 Anthony thoroughly enjoy the Assiette of Duck and I have to agree, the best of the three would be the spring roll. We both also tried an oyster for the first time and we’d definitely order some again if we get the chance – the texture was not what we were expecting and coming from Anthony (not a fishy person) that is quite something! 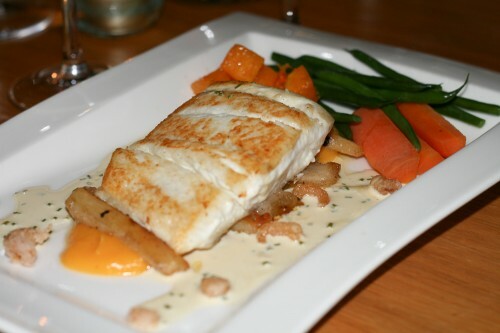 For the main course I chose Halibut served with Roast Salsify, Popcorn Shrimp, Butternut Squash Puree and White Wine Veloute. Anthony couldn’t resist the Venison served with Haggis Fritter. I hadn’t tasted halibut before and I have to admit the Popcorn Shrimp caught my attention – I am very glad they did as the fish was beautiful. It just melted in your mouth and together with the roast salsify and white wine veloute it was fantastic. Anthony ordered the Venison medium and it was cooked perfectly. Again, melted in your mouth. 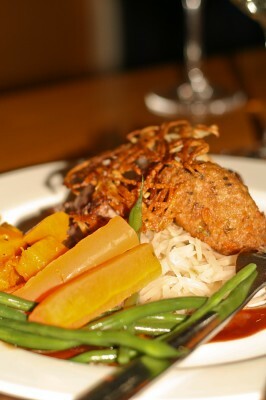 The haggis fritter was like a creamy melt in your mouth mousse but crispy on the outside – amazingly delicious. We managed to squeeze in a pudding and I chose the Chocolate Tart with Orange & Honeycomb and Anthony had a 60 Hope Street Signature Dish, Deep Fried Jam Sandwich with Carnation Ice Cream. I was quite full at the point but it seemed rude not to join in. Again though I felt the chocolate tart did not need the pastry, in fact I left some. The chocolate part of the tart was more like a chocolate fondant than a cold filling like I had expected. 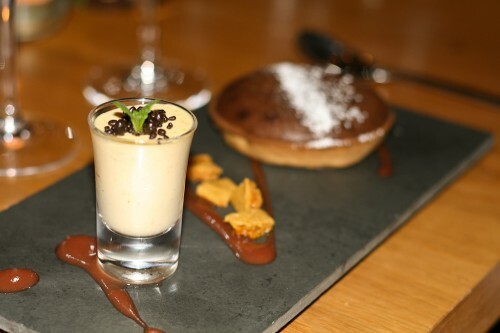 A bitter orange mousse was served alongside the tart in a shot glass and was very nice with the fondant-like filling. 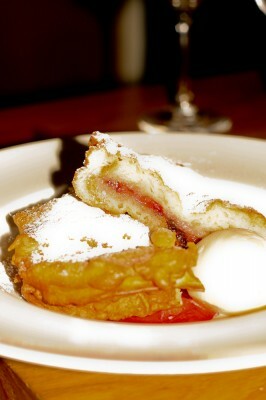 The Signature Dish, a Deep Fried Jam Sandwich with Carnation Ice Cream went down a treat, unsurprisingly! Everyone on the table managed a taste of this jam doughnut style pudding. The rest, Anthony ate very quickly. Need I say anymore?! Overall, we’d definitely go back again if the chance arises. The restaurant itself was lovely, warm and modern. The tables weren’t squashed in or overlooked. A lovely dining experience, some very lovely food and a really nice evening.